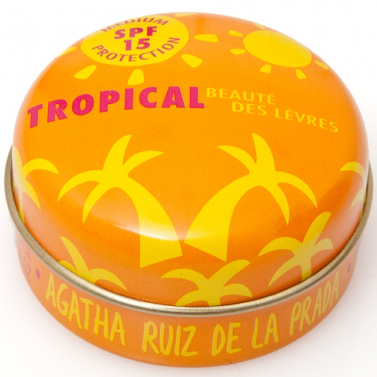 Hydrating lip balm with SPF to nourish your delicate lips. The balm will add a flavorful gleam to your lips and a snap in your step. 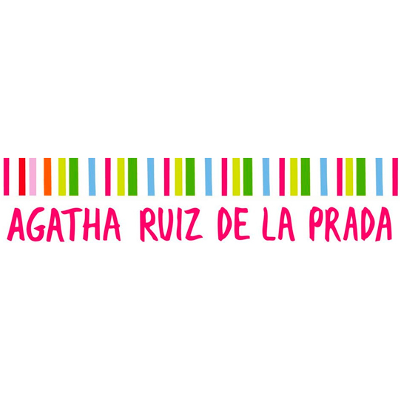 The product softens your lips and contains vitamin E.
Agatha Ruiz is one of Spain's most noted designers, her cute and quirky style is evident in the fun designs of her lip balm tins. 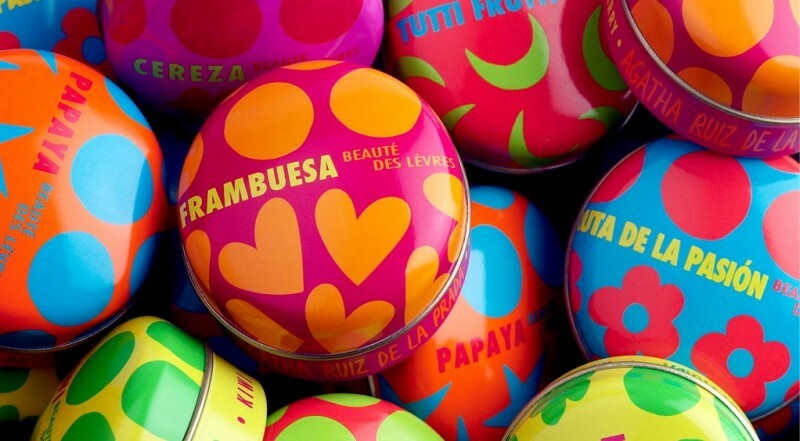 These lip balms smell super fruity and go on smoothly making your lips feel silky! Available in Raspberry, Cherry, Passion Fruit, Tutti Fruity, Papaya, Kiwi. Paraffinum liquidum (mineral oil), cera microcristallina (microcrystalline wax), octocrylene, paraffin, ceresin, parfum (fragrance), tocopheryl acetate, dipotassium glycyrrhizate, hydrogenated vegetable oil, sorbitan tristearate, limonene, CI 15850 (red 7 lake), CI 19140 (yellow 1 lake). Agatha Ruiz de la Prada's lip balms had been common residents of duty free shops, and that was where I met my Tropical SPF15 'guy' so to say. I was enticed by the joyful range of colours and scents, all promising moist future to my lips. The packaging indeed helped lift the spirits each time I held it but the tin was a tricky one to open, especially if my hands were wet. 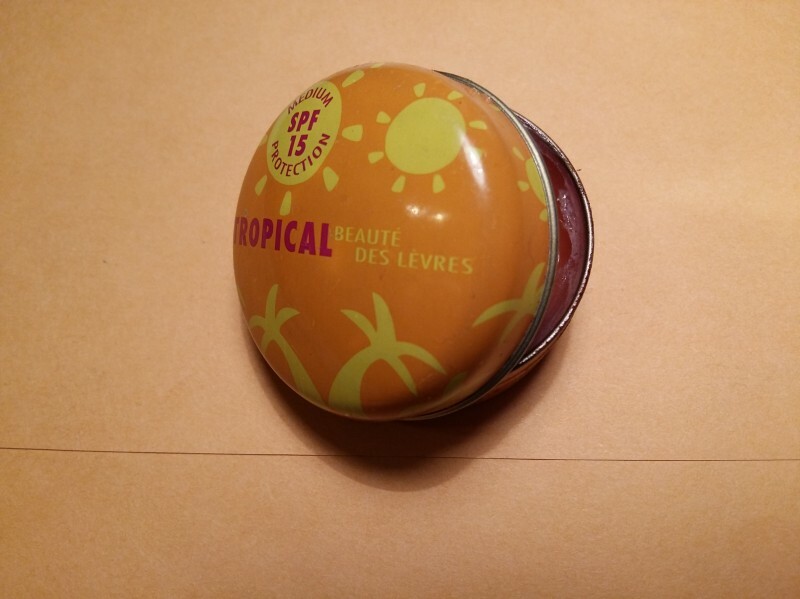 The balm smelled deliciously and effectively moistened the lips for quite a time. It was not greasy, but a bit waxy. Despite its orange colour it was barely discernible on the lips. I had chosen tropical variety but all others like raspberry, tutti frutty, cherry were equally tempting to surrender to. What I did not appreciated about the balm is the fact that to apply I had to get my fingers 'dirty', which is not a very hygienic way, I admit. In addition, the list of ingredients did not exactly screamed ‘natural’ at me. Thus, after some time I discontinued using it and switched to another brand lip balms. In general, I can recommend this product due to its great moisturising properties; it has its advantages and can be worn all year round.